ACTS passed in the Parliament, holden at Westm. the 23d Day of January Anno Regni Regis Edwardi Sexti Quinto; and there continued until the 15th Day of April, Anno Sexto. AN Act repealing a Statute made in the Fourth Year of King Henry the Seventh, against the bringing in of Wine and Wood in strange Bottoms. An Act touching the Exchange of Gold and Silver. An Act limiting what Persons shall weave or make Broad Woollen Cloth. An Act to take away the Benefit of Clergy from such as rob in one Shire, and flee into another. An Act for the keeping of Holidays and Fasting-days. An Act for the putting down of Gigg-Mills. An Act for Writs upon Proclamations and Exigents to be current within the County Palatine of Lancastre. An Act for Keepers of Ale-houses to be bound by Recognizance. An Act for the Assurance of the Manor of Merryvall, in the County of Warwyke, to William Devereux, during his Life. An Act for the Assurance of certain Lands sold by the King's Majesty to the Mayor and City of London. An Act for the Restitution in Blood of the Heirs of Sir John Nevyll. An Act touching the Marriage and Inheritance of the Lord Marquis of Northampton, and Lady Elizabeth his Wife. An Act against Fighting and Quarrelling in Churches and Church-Yards. An Act for the Restitution in Blood of John Forteskue. An Act for the making of Hats, Dornykes, and Coverlets, at Norwiche, and in the County of Norff. An Act against Regrators of Tanned Leather. 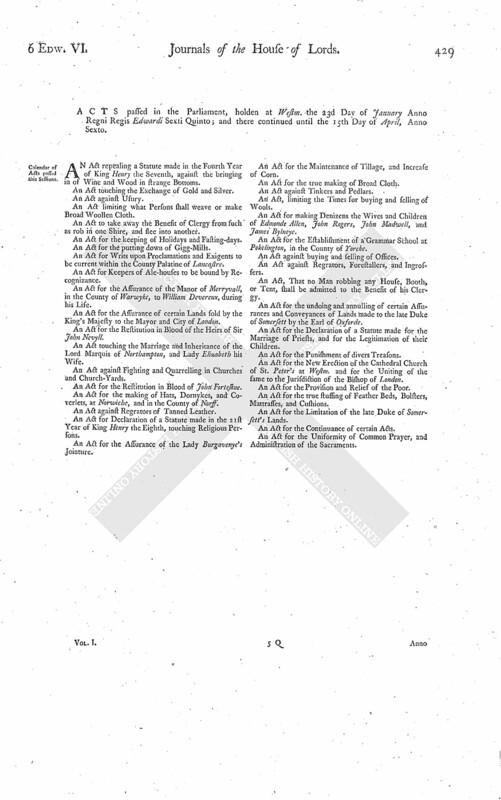 An Act for Declaration of a Statute made in the 21st Year of King Henry the Eighth, touching Religious Persons. An Act for the Assurance of the Lady Burgavenye's Jointure. An Act for the Maintenance of Tillage, and Increase of Corn. An Act for the true making of Broad Cloth. An Act against Tinkers and Pedlars. An Act, limiting the Times for buying and selling of Wools. An Act for making Denizens the Wives and Children of Edmonde Allen, John Rogers, John Madwell, and James Bylneye. An Act for the Establishment of a Grammar School at Pokelington, in the County of Yorcke. An Act against buying and selling of Offices. An Act against Regrators, Forestallers, and Ingrossers. An Act, That no Man robbing any House, Booth, or Tent, shall be admitted to the Benefit of his Clergy. An Act for the undoing and annulling of certain Assurances and Conveyances of Lands made to the late Duke of Somersett by the Earl of Oxforde. An Act for the Declaration of a Statute made for the Marriage of Priests, and for the Legitimation of their Children. An Act for the Punishment of divers Treasons. An Act for the New Erection of the Cathedral Church of St. Peter's at Westm. and for the Uniting of the same to the Jurisdiction of the Bishop of London. An Act for the Provision and Relief of the Poor. An Act for the true stussing of Feather Beds, Bolsters, Mattrasses, and Cushions. An Act for the Limitation of the late Duke of Somersett's Lands. An Act for the Continuance of certain Acts. An Act for the Uniformity of Common Prayer, and Administration of the Sacraments.